No one talks about the devil anymore. No one believes that he exists. If anyone were to talk about the devil, he’d be considered a religious fanatic, unscientific, and old-fashioned. If the devil was real, then what a victory for him! Isn’t that a principal in warfare? Convince your target that no threat exists. 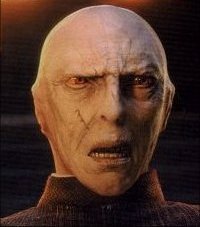 The devil, if he exists, has so thoroughly convinced the world that he doesn’t exist that I had to resort to using a work of fiction as an analogy: what Lord Voldemort did in Harry Potter is what the devil is doing in our world, today. By the time popular culture admits that the devil exists, it would be too late — just like it was too late for the wizarding and Muggle world in J.K. Rowling’s story. Fortunately, the wizarding/Muggle world had Harry Potter. We have Christ. There can be no dialogue with the prince of this world: let this be clear! Today, dialogue is necessary among us humans, it is necessary for peace. Dialogue is a habit, it is an attitude that we must have among us to feel and understand each other… and that [dialogue] must be maintained forever. Dialogue comes from charity, from love. But with that prince, it is impossible to dialogue: one can only respond with the Word of God who defends us, for the world hates us – and just as he did with Jesus, so will he do with us. “Only look,” he will say, “just do this one small little scam… it is a small matter, nothing really” – and so he begins to lead us on a road that is slightly off. This is a pious lie: “Do it, do it, do it: there is no problem,” and it begins little by little, always, no? Then [he says]: “But… you’re good, you’re a good person: You [get away with] it.” It is flattering – and he softens us by flattery: and then, we fall into the trap. You may ask the question “Father, what is the weapon to defend against these seductions, from these blandishments, these enticements that the prince of this world offers?” The weapon is the same weapon of Jesus, the Word of God – not dialogue – but always the Word of God, and then humility and meekness. We think of Jesus, when they give that slap: what humility! What meekness! He could have insulted him, no? One question, meek and humble. We think of Jesus in His Passion. His Prophet says: “As a sheep going to the slaughter.” He does not cry out, not at all: humility. Humility and meekness. These are the weapons that the prince and spirit of this world does not tolerate, for his proposals are proposals for worldly power, proposals of vanity, proposals for ill-gotten riches.